Is your cat looking a little more like a watermelon and a little less like a panther lately? Read on for tips on how to get that panther-body back in shape for summer! As dedicated guardians, we can sometimes love our furr-balls too well, leading to a body shape that is less panther and more swollen watermelon. 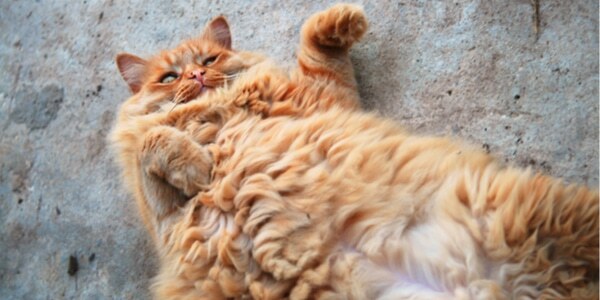 In percentage terms, an extra kilo for your cat is equivalent to around 20% weight gain. This puts pressure on their little frame and can lead to diabetes, arthritis and liver problems. So while kitty may be telling you they are starving through sad meows and over the top leg weaves, the kindest thing you can do is say no to extra food. Cats generally don’t lose weight easily, so to get kitty’s panther-body back, you’ll need to give it some extra focus. Before you go investing in an expensive bag of diet food, make sure you understand why your cat has gained weight. Here are some key questions to ask that may help identify the problem. 1. Do you read the label on kitty’s food packet and properly measure portions? This easily dealt with if you tend to be too generous with portions. Put the food bowl on the scales as you fill it or use a measuring cup (some food brands provide this for free, grab one from the pet shop next time you go). 2. Do you have multiple cats who are stealing each other’s food? Some kitties like to eat slowly and ponder every bite, while others frantically cram food into their mouths in a desperate feeding frenzy. Supervise the frantic ones and make sure they are not dishpigging other bowls – these guys tend to be the watermelons. 3. Is kitty finding food outside? This is a tricky one to manage if your cat goes outside a lot. If you’ve cut down their food at home and they are still not losing weight, this is probably the reason. Keep them in for a 2 week trial period and perform regular weigh-ins to see what happens. Or if they must go out, only let them out before dinner time, so they come back quickly and hungry. 4. Is someone else in the house buying #catlove with extra treats? Food doesn’t make cats fat, people make cats fat. You need to interrogate everyone in your household to flush out the perps and make sure they understand the importance of keeping kitty at a healthy weight. Now you’ve ruled out these hip-padding factors, you can get a better hold on kitty’s intake and start the slimming process. Now’s the purrfect time to get back in shape, so your cat can show off their sleek new panther look during summer!